ریوندی, امیر, نصر اصفهانی, محمد علی, معماریان, محمد حسین. (1392). اثر نوسان اطلس شمالی بر الگوی غالب وردایی ارتفاع ژئوپتانسیلی در منطقه مدیترانه با استفاده از تابع‌های متعامد تجربی. 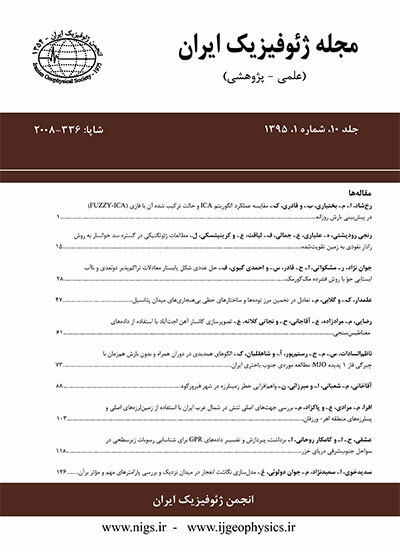 مجله ژئوفیزیک ایران, 7(3), 66-77. امیر ریوندی; محمد علی نصر اصفهانی; محمد حسین معماریان. "اثر نوسان اطلس شمالی بر الگوی غالب وردایی ارتفاع ژئوپتانسیلی در منطقه مدیترانه با استفاده از تابع‌های متعامد تجربی". مجله ژئوفیزیک ایران, 7, 3, 1392, 66-77. ریوندی, امیر, نصر اصفهانی, محمد علی, معماریان, محمد حسین. (1392). 'اثر نوسان اطلس شمالی بر الگوی غالب وردایی ارتفاع ژئوپتانسیلی در منطقه مدیترانه با استفاده از تابع‌های متعامد تجربی', مجله ژئوفیزیک ایران, 7(3), pp. 66-77. ریوندی, امیر, نصر اصفهانی, محمد علی, معماریان, محمد حسین. اثر نوسان اطلس شمالی بر الگوی غالب وردایی ارتفاع ژئوپتانسیلی در منطقه مدیترانه با استفاده از تابع‌های متعامد تجربی. مجله ژئوفیزیک ایران, 1392; 7(3): 66-77. نوسان اطلس شمالی (NAO) به‌منزلة یکی از مهم‌ترین عوامل وردایی سالانه گردش کلی جوّ در نیمکره شمالی شناخته می‌شود. در این تحقیق با استفاده از تابع‌های متعامد تجربی (EOF) به ‌بررسی وردایی ارتفاع ژئوپتانسیلی ترازهای 1000 و 500 هکتوپاسکال در دوره‌ 1948-2005 برای فصل زمستان در منطقه دریای مدیترانه و جنوب غرب آسیا با استفاده از داده‌های NCEP/NCAR پرداخته شده است. نتایج نشان داد که 8/32 و 2/16درصد از کل واریانس ارتفاع تراز 1000 هکتوپاسکال به‌‌ترتیب ناشی از مد‌های شماره‌ یک و دو است و اولین مُد استخراجی برای منطقه الگوی نوسان شمالگان (AO) را نشان می‌دهد. دو مُد اول وردایی ارتفاع تراز 500 هکتوپاسکال به‌‌ترتیب دارای 24 و 4/21 درصد واریانس هستند که اولین مُد الگوی نوسان شرق اطلس- غرب روسیه را نشان می‌دهد. در ادامه ماه‌های با مقادیر بحرانی نمایه مثبت و منفی نوسان اطلس شمالی مشخص شد و تابع‌های متعامد تجربی برای این ماه‌ها به‌‌‌طور جداگانه محاسبه و استخراج شده است. ماه‌های بحرانی فاز منفی NAO شامل 33 ماه و مدهای استخراج شده برای این ماه‌ها برای ارتفاع تراز 1000 هکتوپاسکال به‌ترتیب شامل 35 و 20 درصد از کل واریانس است. برای این فاز مدهای اول و دوم وردایی ارتفاع تراز 500 هکتوپاسکال در منطقه مدیترانه به‌‌ترتیب دارای 5/31 و 17 درصد واریانس هستند. ماه‌های بحرانی فاز مثبت NAO نیز شامل 29 ماه و مدهای استخراجی برای ارتفاع تراز 1000 و 500 هکتوپاسکال به‌ترتیب دارای 4/31، 5/23 و 29/17 درصد از کل واریانس است. Similar to the Southern Oscillation which is the most evident teleconnection pattern in the Southern Hemisphere, the North Atlantic Oscillation (NAO) is the most significant teleconnection pattern in the Northern Hemisphere. The NAO is known as one of the most important factors effective on the seasonal and annual variability of the atmospheric general circulation in the Northern Hemisphere. The NAO is a meridional large-scale oscillation in the sea level pressure of the subtropical Atlantic high pressure (Azores high pressure) and subarctic Icelandic low. In this study, Empirical Orthogonal Functions (EOFs) technique is used to investigate variability of the geopotential heights at 1000-hPa and 500-hPa levels. The data used covers the winter months (December to February) between 1948 and 2005 in the Mediterranean region and the south-west of Asia obtained from the NCEP/NCAR Reanalysis data set. EOF is a statistical method to calculate the variability of meteorological quantities. Meteorology and climatology scientists are faced with large amount of data (time series) which are obtained from meteorological stations or a regular network. Recently, EOF techniques have been used to reduce all known and unknown factors effective on the atmospheric variability to several new factors. These new factors (patterns of variation) are independent statistically and explain the major part of the total variance in the primary data. The advantage of this method is to describe the spatial and temporal variability of the meteorological quantity using just a few modes. Usually, most of the variance of a time series is distributed in the first few EOFs which can tell us about the undelying dynamical mechanisms working in the atmosphere. This method is described as an experimental method because the EOF patterns are computed using the covariance analysis of a specific data set. Results show that 32.8 and 16.2 percent of the total variance of geopotential height at 1000-hPa level are due to the first and second EOF modes, respectively. Therefore, the first mode indicates an Arctic Oscillation (AO) pattern. The AO is a simultaneous anomaly in the Sea Level Pressure (SLP) between polar and mid-latitude regions in the Northern Hemisphere. This anomaly has been indicated as positive and negative phases. The first two modes of the geopotential height variability at 500-hPa level explain 24 and 21.4 percent of the total variance, respectively. At this level, the first mode indicates the East-Atlantic/West-Russia Oscillation. In the next stage, all winter months are classified to critical positive and negative months based on their NAO indices, and EOF modes are separately extracted for the two groups. The critical negative months included 33 months. Their first two extracted modes for the 1000-hPa geopotential height explain 35 and 20 percent of the total variance, respectively in the whole Northern Hemisphere. The first two modes for the Mediterranean region show 31.5 and 17 percent of the total variance, respectively. The critical positive group included 29 months and the first two extracted modes for the 1000- and 500-hPa geopotential height show 31.4, 23.5 and 29, 17 percent of the total variance, respectively. It is also found that modes of the critical positive phase of the NAO correspond to the EOF modes of all the data used. However, they show more variability. In the critical positive phase of the NAO, the geopotential height variability at the 500-hPa level is noticeably greater than the critical negative phase in the Eastern Mediterranean and in Iran. برومند، ص.، 1386، ارتباط نوسان‌های گردش جوّی اقیانوسی اطلس شمالی با خشکسالی‌های آذربایجان شرقی، پژوهش‌های جغرافیایی، 60، 147-156. حضرتی، ش.، 1383، بررسی ارتباط تراز دریاچه ارومیه با شاخص‌های اقلیمی انسو و نوسان اطلس شمالی، پایان‌‌نامه کارشناسی ارشد، مهندسی آب، دانشکده عمران دانشگاه صنعتی شریف. خسروی، م.، 1383، بررسی روابط بین الگوهای چرخشی جوّی کلان‌مقیاس نیمکره شمالی با خشکسالی‌های سالانه سیستان و بلوچستان مجله جغرافیا و توسعه، سال دوم، 3، 167-188. خوش‌‌اخلاق، ف.، 1387، مطالعه اثرات نوسان اطلس شمالی بر رژیم بارش و دمای سواحل جنوبی دریای خزر، پژوهش‌های جغرافیای طبیعی، 66، 57-70. عساکره، ح.، 1382، نوسانات اقیانوس اطلس شمالی، نشریه سپهر، دوره دوازدهم، 48، 20-24. مرادی، ح.، 1383، شاخص نوسانات اطلس شمالی و تاثیر آن بر اقلیم ایران، پژوهش‌های جغرافیایی، 48، 17-30. نصراصفهانی، م. ع.، 1388، بررسی اثر NAO و MJO بر اقلیم جنوب غرب آسیا، رساله دکتری، مؤسسه ژئوفیزیک دانشگاه تهران. Barnston, A. G., and Livezey, R. E., 1987, Classification, seasonality and persistence of low-frequency atmospheric circulation patterns: Mon. Wea. Rev., 115, 1083-1126. Cullen, H. M., Kaplan, A., Arkin, P. A., and Demenocal, P. B., 2002, Impact of the North Atlantic Oscillation on Middle Eastern climate and stream flow: Climatic Chang, 55, 315-338. Fukuoka, A., 1951, A study of 10-day forecast: The Geophysical Magazine, 12, 177–218. Greatbach, R. J., 2000, The North Atlantic Oscillation, Stochastic and Environmental Risk Assessment, 14, 213–242. Hurell, J. W., 1995, Decadal trends in the North Atlantic oscillation regional temperature and precipitation: Science, 269, 676-679. Hurrell, J. W., 1996, Influence of variations in extratropical wintertime teleconnections on Northern Hemisphere temperature: Geophys. Res. Lett, 23, 665–668. Jolliffe, I. T., and Uddin, M., 2002, Simplified EOFs-three alternatives to retain: Climate Research, 20, 271–279. Kalnay, E., and Coauthors, 1996, The NCEP/NCAR 40-Year Reanalysis Project: Bull. Amer. Meteor. Soc., 77, 437–471. Kutzbach, J. E., 1967, Empirical eigenvectors of sea-level pressure, surface temperature and precipitation complexes over North America: Journal of Applied Meteorology, 6, 791–802. Kidson, J, W., 1975, Eigenvector analysis of monthly mean surface data: Mon. Rev, 103, 177-186. Kutiel, H., and kay, P. A., 1992, Recent variations in 700 hPa geopotential heights in summer over Europe and the Middle-East, and their influence on other meteorological, factors: Theories and Applications in Climatology, 46, 99-108. Lorenz, E. N., 1956, Empirical orthogonal functions and statistical weather prediction technical report, statistical forecast project report 1: Dep. of Meteor., MIT, 49. Mardia, K. V., and Kent, J. T., 1979, Multivariate Analysis: Academic Press. Obukhov, A. M., 1947, Statistically homogeneous fields on a sphere: USP. Mat., Navk, 2, 196–198. Obukhov, A. M., 1960, The statistically orthogonal expansion of empirical functions: Bulletin of the Academy of Sciences of the USSR, Geophysics Series (English Transl), 1, 288–291. Pagano, T. C., Mahani, S., Sorooshian, S., and Nazemosadat, M. J., 2003, Review of Middle Eastern hydroclimatology and seasonal Teleconnections: Iranian Journal of Science and Technology, 27, 95-109. Rogers, J., and Van Loon, H., 1979, The seesaw in winter temperature between Greenland and Northern Europe. Part II: Some oceanic and atmospheric effects in middle and high latitudes: Mon. Wea. Rev, 107, 509–519. Svetlana, I., 2004, The North Atlantic oscillation and greenhouse-gas forcing: Geophysical research letters, 32, 430-434. Thompson, D., and Wallace, J., 1998, The Arctic oscillation signature in wintertime geopotential height and temperature fields: Geophys. Res. Lett, 25, 1297–1300. Van Loon, H., and Rogers, J., 1978, The seesaw in winter temperatures between Greenland and northern Europe: Mon. Wea. Rev., 106, 296-310. Von Storch, H., 1995, Spatial Patterns of EOFs and CCA in Analysis of Climate Variability, Application of Statistical Techniques, Springer Verlag, Berlin, pp. 227–257. Von Storch, H., and Wiers, W. Z., 1999, Statistical Analysis in Climate Research: Cambridge University Press. Walker, G. T., and Bliss, E. W., 1932, World Weather V, Mem. Roy. Met. Soc., 4, 53–84. Wilks, S., 2006, Statistical Methods in the Atmospheric Sciences, 2nd ed., Academic Press.